A similar thing can be said of catching horses. In order to be caught, a horse has to feel as if he’s not being caught. A +/- 1000 lb. animal gets to make the choice of being caught or not being caught. We may think that we can make that choice for the horse, but we can only successfully persuade. It helps if the horse has been successfully persuaded from an early age so that the choice we want the horse to make has become an unconscious habit. This is often what we rely upon when we catch our horses (or lead them or ride them, or when horses agree to the myriad of things we ask them to do for us or with us). Nevertheless, for some horses, and for some horses in some environments and at some times, whether to be caught or not remains a conscious choice, and that’s when our catching skills are put to the test. A horse that’s escaped…a horse that’s in a large field of grass…a horse that’s with his friends and doesn’t want to be the first to leave…a horse that’s running from flies…an unsure horse with a brand-new handler…or a horse that’s panicked. The worst thing you can do in a case like this is match the horse’s resistance with your own, match the horse’s uncertainty with your own, or match the horse’s panic with your own. You need to be the safe place — you need to be the leader the horse wants to be with not because you’re stronger but because it’s safer for the horse to be next to you (this can take some convincing when you’re up against grass). Small but just as determined. Thanks to Pete Markham for his photograph. We’re often told that it’s important for a horse never to realize how strong he is…that he can get away…that he can win. I’ve always questioned this premise that underlies so much of horse training. I believe it’s not that horses don’t know how strong they are but that they choose not to use that strength against us. It’s not that horses don’t know they can get away but rather that they’d rather be with us. In terms of winning, most horses don’t think it’s worth the cost to win that we willingly spend, sometimes with regret. I think we have the horse’s kindness and social nature to thank for its amiability and cooperation rather than any ignorance or lack of self-awareness on the horse’s part. We don’t give horses enough credit when we assume that they’re as big as they are but don’t know it (except for minis, who know they’re big even if they aren’t)….that they are stronger than we are but don’t know it…that they can outrun us, but don’t know it. I’ve often wondered if the horses at the far end of the bell curve in terms of intelligence know that they don’t need to comply — they remain conscious of the fact that they have choices and they can call it the way they see it, especially if they’re being treated unfairly, and this is accountable for as many rogues as mistreatment or mental instability. And what does all this have to do with catching a horse? Everything. You can’t force a horse to be caught when you want to catch him. The horse has to want to be caught…or at least be willing to be caught. In order to be successful at catching a horse, we have to convince the horse that being caught is something good. That as a result of being caught, we will be happy and demonstrate our pleasure at his choice; that we won’t be angry and punish. So the first step, as usual, is keeping our emotions in check, and making sure we don’t take anything personally. If our horse walks away when we walk up, the worst thing we can do is get angry. Who wants to be around that? Not our horses, especially if they’re already telling us they’d rather be somewhere else than in our hands. Our intent is important (as it always is with horses). If our intent is to catch a horse, that’s less than ideal, even if it is our goal. If our intent is to have the horse want to be caught, that usually works out much better. We’re much less forceful and dominant and insistent when we have the horse’s interests in mind as well as our own. I like to give a horse the chance to do the right thing. I don’t like to come at a horse full bore. Especially if the horse is weighing which he prefers — grass or me. So I use my voice and say something sweet and comforting, usually before I’ve even picked up the halter, if the horse is within earshot. Then I approach obliquely, kind of sidling up so as to ask rather than demand. But I’m not going to start by asking, even when I get right up next to the horse. I’m just there because it’s the best place in the world to be, and I’d like my horse to feel the same about being next to me. If you’ve sidled up, the way I do, it doesn’t hurt to give your horse a chance to settle himself or let you know how he feels. Maybe he needs to tell you that he’d really rather stay on pasture, by taking another bite while you wait. So what, if that means that when you ask for his head three seconds later, he raises it up and puts it in his halter? On occasion, one of my horses likes to tell me by walking a few steps away that he’s not ready to come in. That’s okay too. I wait while he walks, and then I walk up and he lets me halter him. When I see someone carrying a halter in front of them, eyes fixed on their horse and walking right up in front of their horse’s face with that halter raised, I’m never surprised when catching doesn’t go so well. You’ve stacked the deck in your favor if your horse knows he’s going to end up in the barn with his friends….or dinner’s coming. Then you can try to catch a horse all wrong and still have it work out all right. It’s not always so easy. I’ve been the “go to” person for the difficult to catch for a while now. It’s generally best not to be confrontational, but there are times when it’s the only way. The reason why a particular horse might be difficult to catch is particular to that horse and that time, so you need to read what’s going on and try to understand what the horse’s problem is. That can lead you to the solution. Some horses are challenging. Then it’s a game, and you need to outwit your opponent while keeping your sense of humor and patience. You need to wait, the way you would if you were trying not to frighten a fawn. But you also need to be confident that you’ll get your horse (and you will). You need to stay out of the kick zone. You need to be aware of everything you’re saying with your body — and that goes for your eyes and your breath, too. You need to be nimble and versatile and listen to your instincts, which hopefully include not to rush it. There’s always another second to wait, and you’ll seldom go wrong waiting that extra second (unless it’s when your horse is ready to give himself to you). You need to push and wait, ask and wait, know when to leave and wait, to turn your back and wait, know when to ask for sideways movement and wait or for the horse to go away so he’ll want to come back. If you’re good at catching horses that might not want to be caught, you’re good at waiting. But as my Yankee-Irish horsewhispering boyfriend says, “the slow way is the fast way and the fast way is the slow way.” Wait, and you’ll do a whole lot less waiting than if you don’t wait. I’ve danced with a horse that doesn’t want to be caught with steps as dramatic as a tango…and I’ve “joined up” with a horse in a 300′ x 200′ field. Eventually, the halter goes on and it’s usually a relief to the individuals on both ends of the lead rope when it does. Years ago, when I was riding a friend’s horse, she asked me whether I caught her horse with peppermints (his favorite, and lavishly dispensed by his owners). I said no. She asked me, “Well, then, what’s your currency?” I said, “praise.” I realize now that I wasn’t really aware of what my currency was at the time. In retrospect, I realize that more than praise, it was the fact that I was willing to have a conversation, rather than recite a monologue. Language was my currency (body and verbal), not candy. Of course, if your horse is loose, you do what you need to do, and if a bucket of grain will keep your horse out of the road, then you’ve got to use it. But you might find that waiting and asking nicely and being a good dancer is all you really need. One day a loose pony ran into our meadows. He knew he was free and he was having a ball running around the “new world”. Our horses were out in the back meadow away from all the excitement so they weren’t in the equation. I went out to see if I could catch the runaway and luckily he scooted into the front paddock. I closed the gate and now had him contained. I used the natural horsemanship technique I had learned over the years of training Dini. I grabbed a rope and went into the paddock. I looked at the pony and walked towards him. When he gave me a sign of the slightest hint of alarm I quickly looked away and dropped my head down. The pony was intrigued; here was a human who spoke his language. In this manner, I continued walking towards him. When I turned away, he would step closer to me, until we met each other in the middle. When I was right up alongside of him I held out my hand with a carrot piece. Then he allowed me to put the rope on him and walk him home. I fed him the rest of his reward for being a good boy on the way. Textbook catching. Thanks for adding this story, since the classic way to catch a horse — the way you did it — was missing from my (already lengthy) post. I always appreciate your stories and the lessons in them. My horse was impossible to catch when I first got her. The first time I tried to catch her in a field, it took 2 hours and 6 people. This was due to previous mistreatment and her being terrified of people. 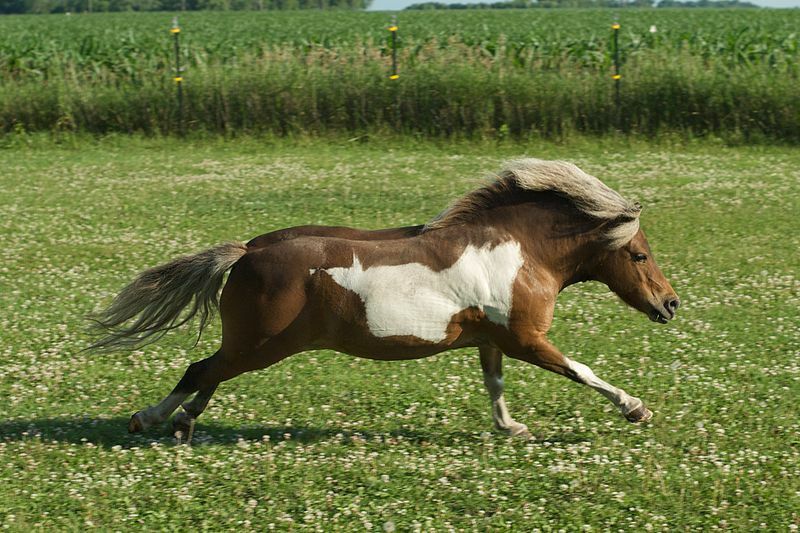 Now, it is pretty easy to catch her, although I do have to use a peppermint when I am in competition with grass. She does not get the peppermint until she is haltered and we are walking toward the gate. It works for us! These are good tips you present. I am going to try them, as I would like to not have to use the peppermint. I’m not a big treat person, but you’re using your peppermint as a reward, not as a bribe, as it should be. It doesn’t sound as if you NEED the peppermint since you already have your mare haltered and leading when you give it to her. I don’t know how long you’ve been rewarding the same behavior with peppermints, but if you suddenly stop, your mare may feel, rightly, that you’re being unfair. Depending on her temperament, that might display itself in a number of different ways. If you do want to change the pattern, I’d suggest adding another reward to the equation — a scratch in a special place, a caress, a loving word — which you can dispense along with the peppermint. Then, after a few days, you can try giving up the peppermint and see how your horse responds. Another thing you can try is building on the behavior you’re currently rewarding, so you’re rewarding later in the game. That will still take a peppermint, but if you add the reinforcing reward when you give the peppermint, you may be able to dispense with the peppermint entirely and have your horse be just as happy. I’d love to hear what you try and how it goes! Hi Paul – Thanks so much for joining in the discussion. You raise an important point about all of horse training — which is training our horses so they can be handled safely and effectively by anyone. That’s the goal and the ideal. Sometimes, though, with horses that have been mishandled, you have to take a detour. It’s worth the work to steer back towards the path after the detour rather than settling into a pattern that’s less than ideal, so your horse will ultimately be pleasant in any company. I admire Allison for her efforts in that regard. Using the “send away” and “welcome back” of the join up are very effective tools for catching a horse that doesn’t want to be caught. But, as you say, it takes a lot of hours to learn the language so you’re saying what you want with your body and not something else! I’ve never seen Kelly Marks do what you describe but it is the ideal, isn’t it? I was so happy the other day when one of the horses who used to insistently walk away instead came trotting up to be taken in. It was that experience which inspired today’s post. My retired TB is happy to put his head in the halter but he’s the one that often ambles away to tell me he would prefer to eat just a little more clover. Now, all I have to do is combine the two! Hi Paul — Thanks for that link. It looks like I need to log in to see the clip, which I’ll be able to do tonight. I really like Kelly Marks. I remember that some time ago, here in the states, there was a “fix your animal” show on TV (BBC America?) that featured Kelly as one of the trainers…the episode with the horse afraid of the pigs is the one I remember, since I’m nearly as fond of pigs as I am of horses. Whatever it is you’re working on with horses, it’s a little bit at a time. If you keep showing up for it, you’ll keep making progress. The thing that some people forget is that they have to train themselves as well as their horses, so healthy self-criticism — looking back and asking “What could I have done better?” — makes for quicker progress. I can tell you’re doing that, and that’s part of your success.